In the fall of 2016, Ohio Attorney General Mike DeWine formed an initiative called CyberOhio in order to assist Ohio businesses against data security threats. The goal is to help foster a legal, technical, and collaborative cybersecurity environment in order to help Ohio businesses, particularly small business, protect themselves and thrive. 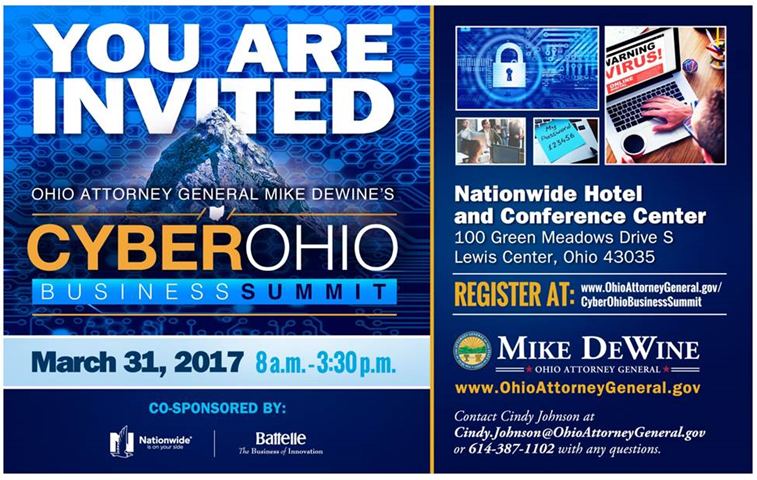 Mr. DeWine has since created the Cybersecurity Advisory Board, composed of industry experts and business leaders. The Board will provide guidance for the Attorney General’s initiatives on cybersecurity. Two of our own NFIB State Board Members are also on Mr. DeWine’s Cybersecurity Advisory Board; Allen Perk, President of XLN SYSTEMS and Bob Kozel, Chief Executive Officer, eInformatics. Both Allen & Bob will be sure that the concerns and protection of Ohio’s small businesses will be addressed and answered. The Business Summit will provide business owners with practical, understandable, and actionable cybersecurity information. You will learn how to better protect your business and yourself from the ever evolving cyber threat landscape. Topics include Malware, Phishing, Password Do’s & Don’ts, Remote Access, Public Wi-Fi, Anti-Virus and much more. Business owners are responsible for any data pertaining to their customers. Do not let technical or financial reasons keep you from knowing what to protect and how to protect it. Attending this Business Summit will explain to you those actionable items you can do now to protect yourself, and your customers, from cybersecurity threats.